Galaxies are immense structures. Composed of gas, dust, dark matter, and billions of stars, big ones can be a hundred thousand light-years across — a million trillion kilometers — and have masses equaling trillions of Suns. Our own Milky Way fits those numbers pretty well. It formed not long after the Universe, itself, did, probably a billion or so years after the Big Bang, collapsing from a vast cloud of hydrogen and helium gas. It wasn’t alone, though: Two other big galaxies were born along with it (the Andromeda Galaxy and Triangulum), and a handful of smaller ones that are all bound by their mutual gravity, forming what we call the Local Group. Some of these galaxies are actually satellites of the Milky Way, in a similar way that the Moon is a satellite of Earth. The two biggest are the Large and Small Magellanic Clouds, with about 10 billion and a few hundred million stars in them respectively, but we know of a few dozen very small dwarf galaxies also in orbit around us. Most of them are extremely faint and hard to detect, and we’re not really sure how many there are in total. That’s actually important to know. Different theories and models of how galaxies form predict different numbers and distributions of dwarf satellite galaxies. 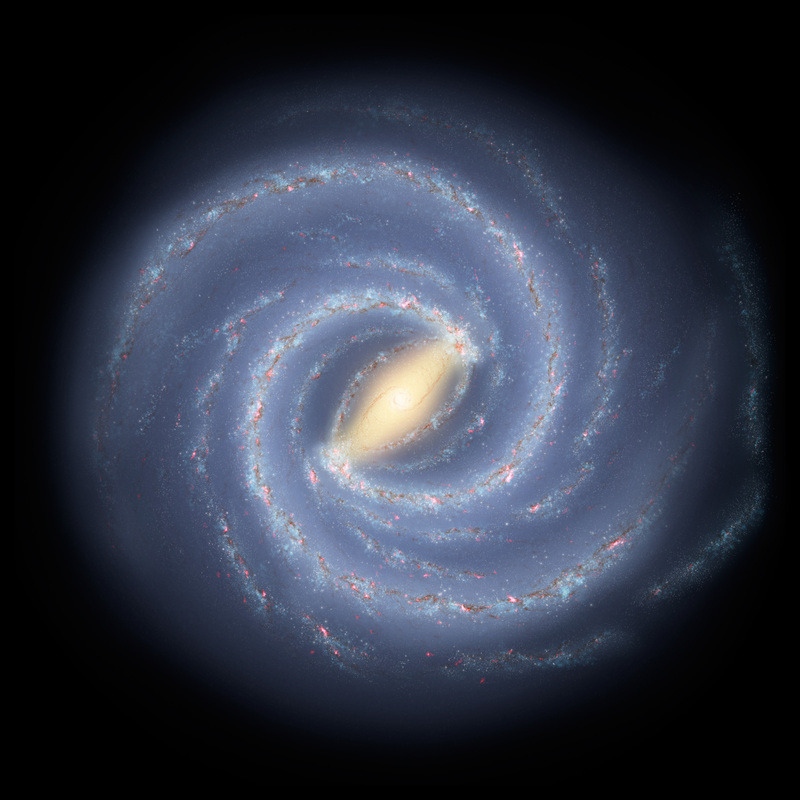 To differentiate them, astronomers scan the skies looking for more Milky Way companions. These surveys are paying off: Nine dwarf candidate (meaning as yet unconfirmed) satellites were found in 2015. Late last year, in 2016, another was discovered, and it’s pretty cool. It was found using the Hyper Suprime-Cam instrument on the gigantic Subaru 8.2 meter telescope. The HSC is itself a bit of a monster; it’s over two meters long, weighs three tons, and takes enormous 870 megapixel images that cover 1.5° of the sky on a side. The Moon is about 0.5°, so this covers an area nearly ten times the area of the Moon. Astronomers aimed it at five separate regions of the sky, covering a total of 100 square degrees (that’s a lot). They mapped where all the objects were in the fields, separated stars from distant background galaxies (stars are point sources, whereas most galaxies are slightly extended), and then looked for places where there were more stars than expected — hoping some might be faint Milky Way satellites. A map of the number of stars seen in the region of Virgo I (left) shows a clump at its location, whereas extended galaxies (right) does not. Credit: Homma et al. In the constellation of Virgo, they found such a clump. It’s unlikely to be a random fluctuation in the distribution of Milky Way stars masquerading as a physical clump; it’s better than 99% certain to be an actual object. To make sure, the astronomers did something clever. In an old dwarf satellite galaxy, it’s reasonable to assume all the stars in it were born at the same time; these galaxies tend to form stars right as the galaxy, itself, forms, then run out of gas to make any more. If the stars instead belong to our Milky Way they would have all different ages, since we’re still actively churning them out. Using models of how stars change color as they age, the astronomers were able to show that the stars in the clump do look to be about the same age —about 13 billion years. Not only that, if they throw away the stars that don’t match that age, the statistical significance of the clump being real jumps up to near certainty. So, this appears to be a real galaxy, which they’ve dubbed Virgo I. The distance (measured by looking at the brightness of the stars in it) is about 280,000 light years away; three times the width of the Milky Way, itself. The size is a bit difficult to determine; galaxies aren’t solid objects and fade with distance from their centers. But it appears this object is roughly 300 light years across. That, in itself, is interesting. First, that’s tiny. Second, there are objects called globular clusters, which are magnificent collections of hundreds of thousands of stars in a ball, all orbiting their common center of mass like bees buzzing around a hive. About 150 of them are known to orbit the Milky Way. While the numbers of stars in a typical globular cluster is similar to Virgo I, the latter is much bigger than what you’d expect for a globular at that distance, making it even more likely this is, indeed, a galaxy. So, this looks to be a legit dwarf galaxy, likely a satellite of the Milky Way, so small and faint it’s escaped detection until now. Now, here’s a fun fact: The astronomers looked at 100 square degrees of sky and found one such object. But there are over 40,000 square degrees of sky, so extrapolating from that means there may be hundreds of these dinky galaxies yet to find! Happily, the survey that found Virgo I is ongoing, so hopefully they’ll start finding more. It’s rather amazing to me that we can see galaxies billions of light years way, nearly to the edge of the observable Universe, but there can be galaxies literally orbiting our own that have gone unnoticed. Of course, the ones we see at fantastic distances are huge and bright, and the nearby ones small and faint. But still, it shows you that, sometimes, treasures can be found on your doorstep if you just look more carefully.